Here at Johnson Lumber, we aim to give you the best quality products and services at a competitive price. The J.F. 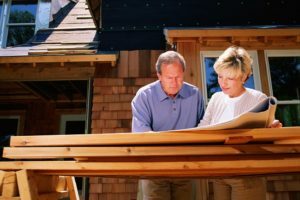 Johnson Lumber Company has been offering our customers in central Maryland–and even beyond–quality products and services for nearly 100 years. We believe our commitment to quality and service is what sets us apart from our competitors and has helped us have such incredible staying power. Our staff of designers, lumberyard employees, and sales representatives makes up the wonderful team we have here at Johnson Lumber. If you’re interested in what products and services we offer, read on below to find out more! The kitchen is truly the heart of any family’s household–it’s where food is created and memories are made and we believe that’s something special. Creating the right kitchen isn’t always easy though, especially when you don’t have access to the right products to make your dream come true. At Johnson Lumber, we offer a massive selection, including 7 cabinet lines, 7 countertop brands, and numerous sink and hardware manufacturers. Within those categories, there are hundreds of different styles and colors to choose from as well. You’ll never feel as though you don’t have enough options. While it’s important to have access to the materials you need to succeed, all the kitchen cabinets and countertops in the world won’t make your kitchen look just right if the design is lacking. That’s why we’ve created a dream team of kitchen designers who know the ins-and-outs of design in such a way that they can get your ideas down on paper and assist in walking you through each detail step by step. Part of what makes our designers so effective is the ability to mix and match different options from different companies to help create the perfect kitchen for you. That includes picking the right combination of cabinet styles, colors, features, and even pricing to fit your specific needs. Let’s take a look at some of our kitchen cabinet creators. Starmark really takes the sentiment that your home is where your heart is seriously. Their cabinetry can suggest being at home with your family and friends, feeling loved, and taking in those relaxing early morning moments. Plenty of our customers are thrilled with Starmark’s cabinetry and we think you may be too. We offer contractor grade cabinets for low-cost renovations but we also have custom made cabinetry for those who are less concerned about price, but WOLF Designer Cabinetry sits roughly in the middle of that spectrum. These semi-custom cabinets work well within a budget but still give a customized look. Wolf Classic offers a great style while also having practical benefits like increased storage. These cabinets work well on any budget while still being high quality and come with a five-year warranty and features typically found in more expensive cabinetry. Aristokraft are considered an industry leader. They work well within whatever price you’re working with and here at Johnson Lumber, we’ll ensure you get the correct design, door style, and color. Aristokraft aren’t new to the scene either–they’ve been creating quality cabinets since 1954. WOLF Transition cabinetry are intended to work well with any design. They’re available in a number of door styles and finishes and are known for their quality construction, increased storage, and easy access. If price is your primary concern, you may want to consider Contractor’s Choice Cabinetry. These are simply the best value in kitchen cabinets available just about anywhere. Whether you’re working with a rehab or a rental unit, this may be your ideal cabinet. For those of us with big, outdoor kitchen dreams, Atlantis Outdoor Kitchen cabinets are perfect. They’re designed to withstand the weather and atmosphere of wherever you live and will stand the test of time. The most luxurious, amazing kitchens out there really hone in on details. One of those details that is often overlooked is cabinet hardware. Ordinary handles on a beautiful cabinet will really destroy the appeal, whereas if you have the right hardware on your cabinet, it can do wonders in a small package. We carry Berenson Hardware’s handles and knobs which we think look quality. We also carry Top Knobs, who are the #1 cabinet hardware manufacturer on the professional market. Once you hold a Top Knobs product in your hand, you’ll certainly understand why they’re so big. Lastly, we carry Amerock Cabinet Hardware, who have been matching cabinet handles and knobs since the 1930s. Kitchen sinks sure have changed in recent years. Not too long ago, your choices were between stainless steel or white or beige enamel, with either single bowl or double bowl options. The good news is, that’s all changed. Johnson Lumber offers sinks in all shapes, sizes, colors, and even materials. Let’s take a moment to look at what sinks we offer. Rohl Sinks believe in creating a unique look brought about by old world craftsmanship and using rare clay. If you’re looking for a unique look, Rohl Sinks may be your best bet. Native Trails want you to head down their own unique path with their sinks and we can certainly see why. BLANCO offers unparalleled quality of design and craftsmanship. Their stainless steel sinks are more than just functional: they’re beautiful and professional as well and are found worldwide. The perfect kitchen is incomplete without the perfect countertops. They make your room feel finished and complete, while also giving you the space to manage your day-to-day-business. It’s important that you choose the right countertop, so let’s take a look at some of the more popular options. Granite is considered a household classic. This is in part due to its wide range of patterns and colors, as well as its durability that makes it great for families with children. It’s typically pretty affordable and, if you work with Johnson Lumber, we can put you in touch with a local granite fabricator to ensure your kitchen gets the countertops you really want. Marble countertops are just as fancy as they sound, offering luxury to whatever homeowner invests in them. They’re also a naturally cool material which can be great for baking stations or keeping a particular spot cool in the summer months when you’re cooking dinner. Plus, you don’t have to use marble countertops throughout your kitchen and they serve as amazing accents. Quartz offer a natural look of beautiful stone and is also very easy to maintain. They’re engineered, meaning you can actually choose between a wide number of colors and patterns, including ones that may not seem like they would easily be found in nature. Plus, they’re stain resistant and require almost no maintenance. For those of you looking for non-traditional options, we also offer silestone, corian, and formica laminate countertops. These are all meant to cover a broad range of different prices and customization, so whatever kinds of countertops you’re looking for, we’ll be able to help you. Many of these options also apply to bathroom vanities. The same amazing cabinet and countertop options you have in your kitchen can carry over to your customized bathroom as well, creating an oasis within your own home that you can retreat to. If you’re looking for the right way to accent your backyard, add value to your home, and increase the usable space available to you, a deck may be the best option to do so. We’re passionate about installing or selling the best decking materials available and offering you with great service. We offer a number of options, such as pressure treated decking, cedar decking, ipe wood decking, and PVC or composite decking. We can also help you design your deck to make the beautiful custom look you are after. With the right windows, your home can be energy efficient and beautiful. In terms of windows, we offer a large number of shapes and sizes that we are able to custom order from Marvin Windows & Doors, Integrity by Marvin and United Window & Door. We also order some of the best exterior doors to welcome you home every day. Fiberglass doors from both Thermatru & Masonite will not only add a beautiful touch to your home but will keep your home sealed to the elements outside. There are many options that we offer for the interior of your home too. Wood, solid-core, and hollow-core are just a few of the interior door options we can get for you. This entry was posted on Monday, October 2nd, 2017 at 11:19 am. Both comments and pings are currently closed.